You can follow me on Twitter, Instagram and YouTube @Jamiex66. Known as the 'World Game', football (or soccer) is popular worldwide, be it from the local high school clash up to the World Cup itself. It connects fans together as they support their fellow favourites. Such a simple event can make people wear their emotions on their sleeves, be it happiness from the final penalty shot to the despair of World Cup glory going up in flames. Football is so important that anytime a company (in this case EA) creates the game that stops the nation on a console, people take notice. Hopefully to have as much fun controlling their favourite team as it is watching their heroes on the pitch. Sadly however, this one was offside. Fifa is known for being the console leader in football software, but when it comes to handhelds football options were few and far between. 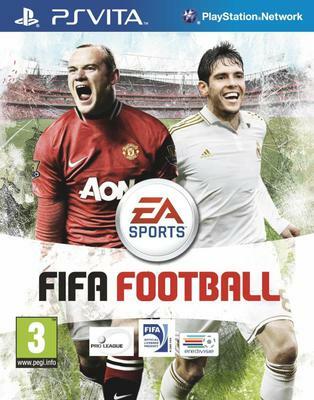 This is where EA stepped up and brought Fifa Football to Playstation Vita. Straight away from the opening sequence you will realize that the excellent graphics have been ported over brilliantly. The lush grass fields look gorgeous and the player motions look as realistic as the console counterpart. Facial animations are not on the same level as Fifa 12, but you are still able to tell the difference between your favourite superstar players. Smaller players however do tend to look generic, though this is not a big drawback. 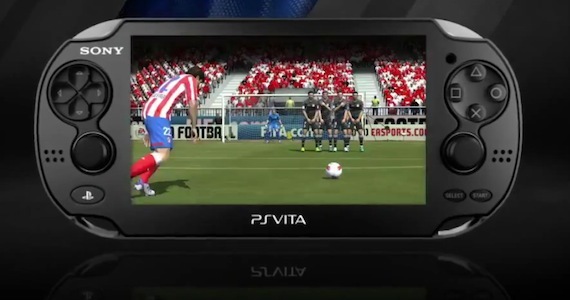 One of Vita's unique characteristics is the front and rear touch pads; Fifa has found a way to incorporate both into its base gameplay. Front touch can be used to select players and pass to the player in mind more easily, this however means your finger is in front of most of the action blocking your view and making games hard to control. However, back touch is incorporated very well. The back screen is the goal, you simply press anywhere on the screen with the amount of power you want and the player on screen will shoot exactly where you want. This is a very cool idea, though a simple finger movement can accidently send the ball flying from your possession when you did not mean to shoot. Seasons are played as they are in real life. You can also create your own player to bring onto your team and take them through the season, this makes season mode more entertaining as your character is constantly levelling up and possibly winning awards if they play well enough. The problem is EA has tried to make the season changeover seem more personal with your player conducting interviews and getting offers from other teams. However after the second season you will find these are basically generic and do not get changed at all depending on how you played during the season. This in turn makes your character seem pointless. Another main problem with the games repetitive nature is the track list, Fifa 12 had almost 40 songs and only handfuls were brought over for Vita. You will end up playing with the volume off as the same tracks constantly annoy. The online mode seemed promising but ends up a muddled mess - invites are almost impossible to accept or send out, joining games is hard to understand and then when you finally find a game, most are snails' pace with major drops in frame-rate. When it does eventually work smoothly, it runs well, but the chances are slim of this ever happening. For the trophy hunters out there, the platinum trophy is also glitched within this game. EA has been contacted and have issued statements stating that there is no way to fix this, so unfortunately this game may never be platinumed. Fifa Football looks amazing at a glance, but when played for a good amount of time the yellow cards start to show. The game feels like a cheap port of the Fifa 12 console game with the small track list, muddled online play and generic character advancement in season mode. Overall it feels like EA just wanted to get a Fifa game into our hands on the go, without much effort. It is sad since Fifa on consoles is not only a leader in the sport, but in the sports genre. Those looking for football on the go should avoid this. Instead, bring a football of your own along with you. Why? Fifa finally makes its jump to the Playstation Vita, however this pass towards goal was caught offside. Good read. Certainly hit a goal with this one. Good review Jamie. I really liked how you set up the opening before you got into the review.